After so many weeks of desperately hoping and praying for homecooked food, my hubby and little boy finally had their prayers answered! Goodbye excuses of “no time” and “too lazy”, last Sunday saw me in the kitchen, giddily cooking up a meal. My parents came for a visit all the way from Ipoh, so they had the rare opportunity to sample the result of my culinary adventure. 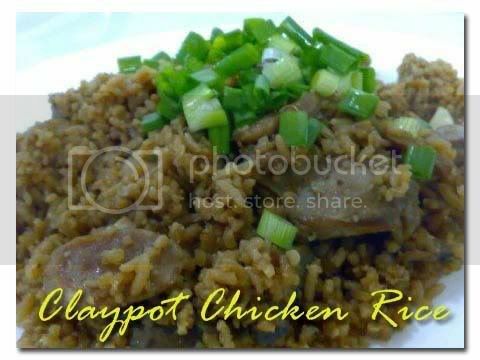 The chicken rice was actually *tipu* claypot chicken rice, because I used the rice cooker. Heh heh heh…. And it was the first time my Mom (the claypot chicken rice sifu from whom I learnt the art from) actually tried it. …. Pressure, pressure….. The secret of course is in the marinade, and I used light soy sauce, pepper, black soy sauce, some sesame seed oil and some oyster sauce to marinade the chicken pieces. 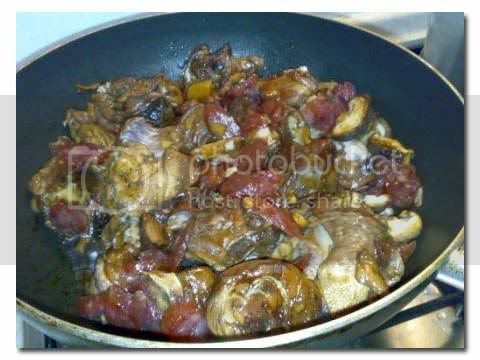 I added some pieces of chicken gizzard too – absolutely love the crunchiness of it! I left it to marinade before I went for church in the morning and when I came back, it was all ready to be cooked! First I fried the shallots, garlic and ginger slices until fragrant. I put in a lot of ginger slices because my hubby and I simply love the taste of it. Then I added the marinated chicken, sliced toong-ku (shiitake mushrooms) and lap cheong (chinese sausage). Next, I added in the washed rice and stir fried for a few minutes. I then transferred the mixture into a rice cooker, added enough water to cook the rice and poured in generous pieces of kiam-hoo-bak (salted fish meat) right on top before I hit the Cook Rice button. I served it hot, garnished with spring onions and of course, lat-chew-chai aka cili padi (bird’s eye chilli). Although I had cooked the chicken rice many many times before, it was my first attempt with the kerabu. I normally serve my chicken rice with just cucumber slices, but I was feeling adventurous this time round, so I thought of trying to make a simple version of the kerabu, a favorite appetizer among all Malaysians. The previous night, we bought a small pineapple and I attempted to cut it (first time too!). 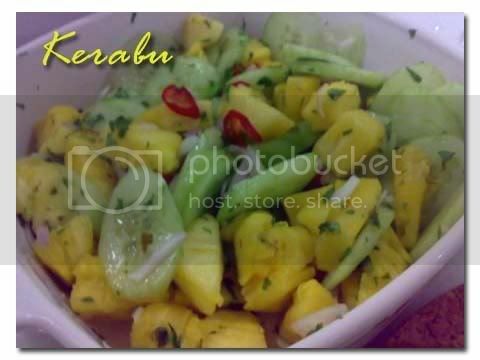 The kerabu was fairly easy to make and it was a matter of mixing everything up. I simply stirred in the pineapple, cucumber slices, cili padi (bird’s eye chilli) and sliced shallots…oh yeah, for a hint of aroma, I added finely chopped mint leaves too. I then squeezed the juice of a medium-sized lime onto it and mixed up the concoction real good. Then I left it to chill for about an hour in the fridge. That will allow the juices to permeate and give it the right taste. This entry was posted in Close to Heart & Home, Drooling & Cooking. Bookmark the permalink. 19 Responses to Yes, the Giddy Tigress can Cook! The Giddy Tiger says: Same here, same here… now now, stop licking the PC screen there! Wahhhh. such a good wife 🙂 Can cook sommore.. Me,…. lousy one. The Giddy Tiger says: Like they say, the way to a man’s heart is thru his…. (all together now)… STOMACH! wah….looks good ya…!! *yum-yum* the chicken rice ! 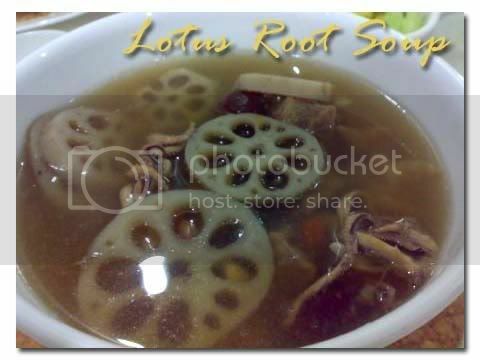 The Giddy Tiger says: So we trade 50/50 claypot chicken rice and kali kai – can? Oh! That looks yummy! I haven’t had good claypot chicken rice in a long, long time now… the last time I had it from a stall in a foodcourt it was burnt and tasteless! The Giddy Tiger says: Yep, and then you can *show off* in your *hut* eh? wah… not bad wor… still can cook up a storm! The Giddy Tiger says: Thanks for believin’ ! I hope they woke up in time for seconds at supper. That looks so good!!! The Giddy Tiger says: Sure sure…just mix everything up really good…and then send some over to Penang for sampling! Wow, that’s nice! I want homecooked meal too! Haha… your family is really lucky. The Giddy Tiger says: Thanks for the compliment! Yummy yummy, look so delicious! Glad that you have the recipe there, might try that out one day. The Giddy Tigress says: Yes, and let me know how that goes!